Here's a tiny update, the Trespasser Weapon Sound Overhaul! This is a small mod I did a long time ago for a user who wanted to replace the weapon sounds with his own selection. I never released the file publically, and the user seems to have disappered since (if you're the one reading this, feel free to let me know who you are! ), so I've decided to put the file up for download. It works as an additive Effects .TPA file which you can attach to your mod in order to replace most of the gun sounds with these excellent new ones! You are just full of surprises! No one would have expected TheIdiot to release a sound mod for Trespasser. Now here I am by myself, uh talking to myself. Now THAT is chaos theory! No one expects the Spanish Inquisition! LOL! I figured I'd make myself a release thread for whatever useless junk I spam the community with. All the cool kids are doing it! Only random stuff will be posted here - all RTJP content as well as other larger projects will remain in their respective section. Feel free to use anything here in your own works! I've put everything under spoilers to declutter the page somewhat, so click "Show" to get the description and link. This is my attempt to improve the textures for Tres using the new CE engine. Not everything is complete, but it gives several objects new life, especially in the Beach level. So we all have to start somewhere, right? Well, here's my beginning. In 2008, I first played Trespasser, and by 2009, I knew a fair amount about the game, as well as the universe it resides in, though it seems I knew nothing about the beta version as you will read. Something that bugged me was that we never got to see what lies beyond the mountains to the east of the town, as well as the northern coast up to Mount Watson. I didn't know about The Plains or really even much of the geography. So began the creation of my first mod project ever - Operation Lizard Tooth, the granddaddy of RTJP. If my memory serves me right, the premise of this mod was that you were a CIA agent - named Diana I-can't-remember-her-last-name-but-it's-not-Forman - patrolling the skies of Isla Sorna when a pteranodon takes you down, crashing into a mountainside. Your goal was then to make your way north from the mountain at the center of the Beach level to the shore just next to the location of The Ascent Part II. I can't remember exactly the order or name of the levels, but I remember there being either six or seven of them. 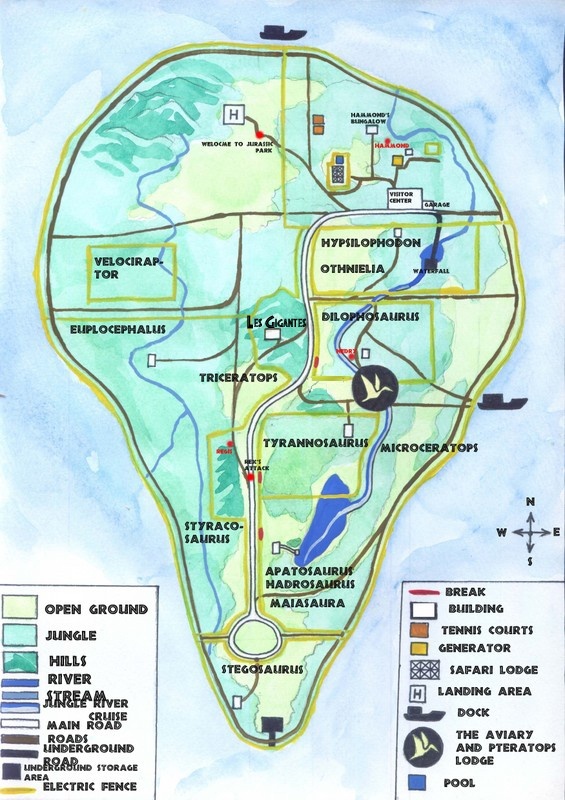 The only one I ever worked on was Cliffs, and naturally I encountered a billion newbie problems that ultimately doomed the fate of the project, prompting me to start on something even more ambitious - Isla Nublar. The game began with the player descending from the wreckage of her helicopter, fighting her way down the side of the mountain past some hungry Raptors, passing through a cavern and going over a waterfall into a misty valley. The valley would take the player along a river, through a swamp and to the shore. After some cliff jumping, the player would come to the waterfront / harbor from JP3, here encountering the game's recurring antagonist - a heavily scarred allosaurus. 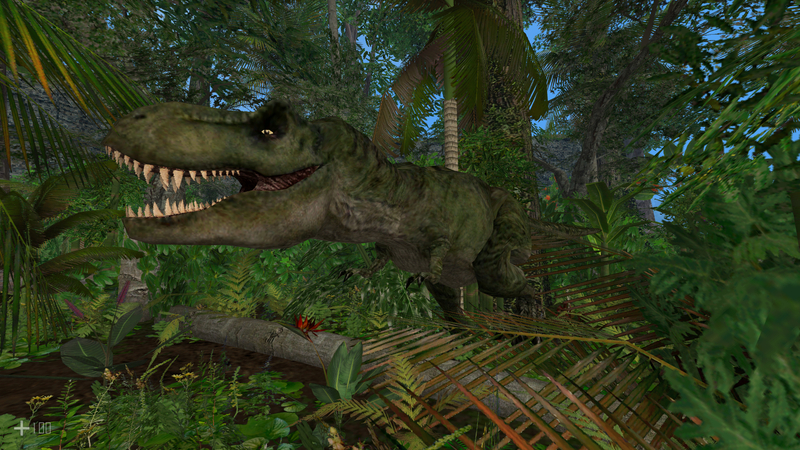 This creature would pursue the player through the next level, disappearing again until the last level, which would have followed the streambed where Dieter Stark was killed by the compies, ultimately leading to a final battle with the allosaurus. Once this was over, it would run into a rockslide, crushing itself and opening the exit to the JP3 rescue beach, where the player would start a small boat and escape. Here is the one file I found that remains of it, the Cliffs level. It's barely complete, and the Raptor at the start crashes the game, so it's not really playable. This was my very first level - as such, it isn't anything special, and my understanding of the game was extremely meager, but I figure it's probably better up here than sitting on my old computer rotting for eternity. Here's a rather odd looking edit I did a long time ago of a picture I found of Lara Croft, changing her into Anne. 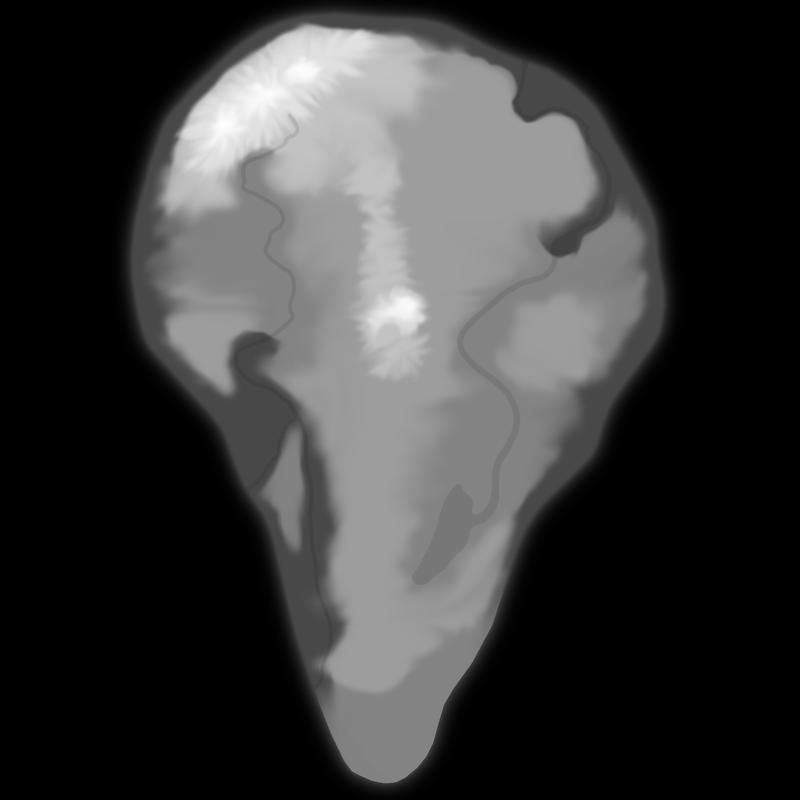 This was intended for the title screen of my Spino Escape level (part of my Trespasser remake, which I sadly no longer have). 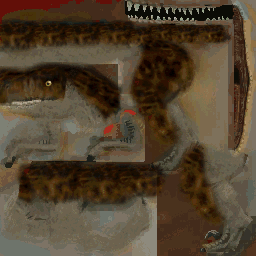 Another oldie, here's a skin of the JPOG Raptor, made to look like a juvenile JPDS megaraptor. This was also part of Operation Lizard Tooth and later intended for my Trespasser level remake. It's highly likely to have some severe seam issues. A folder of old RTJP stuff, all of which is no longer in use, from the 2013 and 2015 versions. 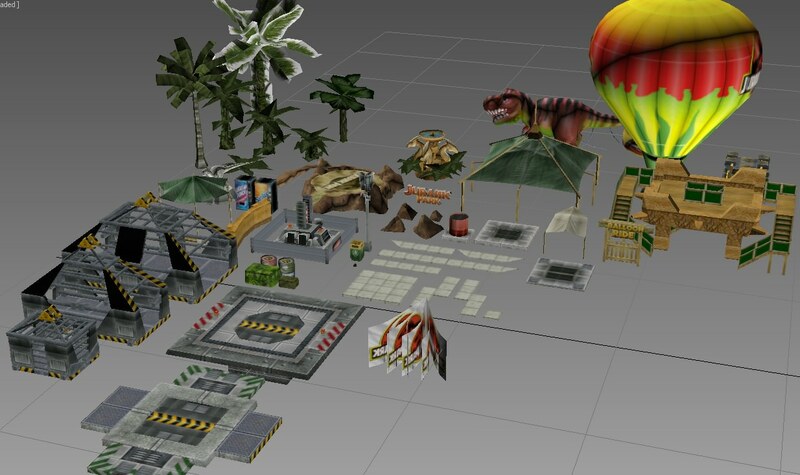 Contains a lot of terrain textures from previous versions, as well as some old models that I have no use for, including a film-accurate Tres Stego skin, a somewhat inaccurate 6-foot fence model, and a couple of unfinished buildings, among others. Note that this is not ALL of the JPOG models, but contains a lot of them. There is plenty of misc stuff that will likely be of use one way or another. None of these have physics at the moment, but feel free to make your own physics and T-scripts for these models. There is also a lack of opacity mapping, so you'll have to edit those in yourself as well if you plan on using any of the plants. 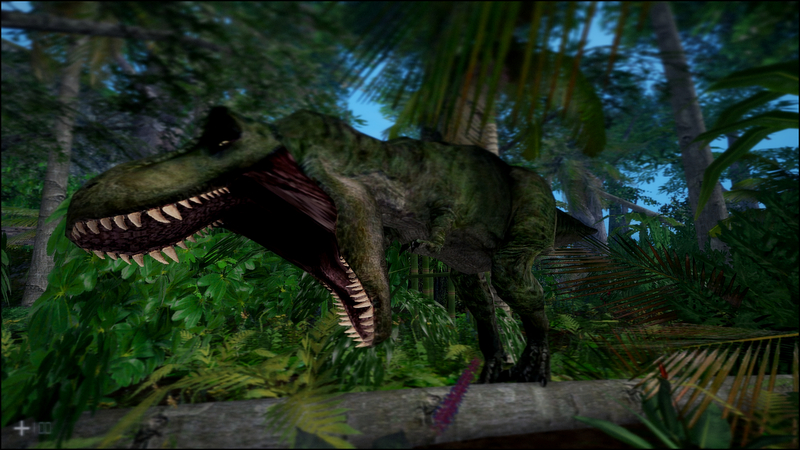 A new tyrannosaurus skin based on the JP3 one, originally made for testing out dinosaurs in the MegaJungle environment. Ready for importing straight through GeomAdd. Also includes 512x textures and bumpmaps for CE. Has a couple of minor seams around the neck, arms and tail, but is otherwise complete. Top image is without bumpmaps, HD textures, and ReShade, bottom is with. Here's a tweak I made for the default CE HUD styled after the JPDS HUD. You can play it with any level if you want, although it was designed for JPDS to replace the non-functional HUD. It's not an exact replica of the original since I couldn't figure out how to extend the background, but it works well enough for now. Note that it doesn't show the reserve ammo, only the ammo you have in the gun in your hand. The HUD is also vaguely transparent to keep it from being distracting. To run this, create a folder called "Scripts" in your main Tres directory (wherever your data folder is located), or in a CE mod sub-directory, and extract all of the files there. It will work from there on flawlessly. If you install it to the main directory, it will also work with any CE-loaded mods you use, but will be overridden by mod-specific HUDs. Just to let you know, your JPDS-style HUD for CE link is broken. I think you typed it in wrong since it is not directing me to the download. I really wanted a HUD so that I could see my ammo and stuff. Hopefully it gets fixed. Also how do you use the new gun sounds and effects. There is only one file included with the download, TWSOEffects.tpa. Do I just drop that into the trescd data folder or do I have to do something special to get it to work? Crap, I'll fix the JPDS HUD link right away. Mediafire can sometimes do that. Still agreeing with Rebel, the how-tos of CE are very scattered. TI, I don't suppose you could be the one to write something up? Thanks. Can't wait to test out these cool mods. I understand, unfortunately time isn't really in my favour, and I'd want to do a comprehensive guide with images if I were to do so. For now, the best thing to do is just to read the documentation as it does cover everything. It's lengthy and somewhat messy, but it does cover everything. Don't get cheap on me, TheIdiot. That was Hammond's mistake. But yeah, I feel that a well organized guide would be great! Whenever you have the time that is.